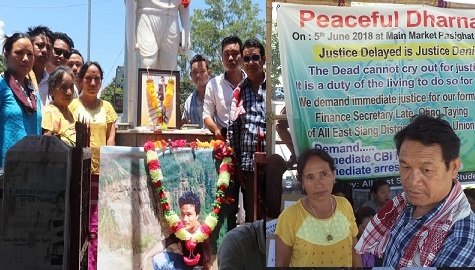 The Arunachal unit of North East Human Rights Organization (NEHRO) has called upon the state’s director general of police (DGP) to hand over the Lt Ojing Taying murder case to the Central Bureau of Investigation (CBI). Lt Taying, a former finance secretary of the All East Siang District Students’ Union, Pasighat was brutally attacked by some unidentified miscreants here on the fateful night of June 10 last year. He succumbed to his injuries 9 days after the incident at the GNRC hospital in Guwahati. “The state’s police department has miserably failed to make any breakthrough in Taying’s murder case and neither has it been able gather clues about the culprits which show the inability of the police and the state’s home department. “The incident has already shattered the lives of the victim’s family and the way the police department is handling the investigation is really uncalled for,” NEHRO general secretary Buteng Tayeng wrote in the representation submitted to the DGP’s office on Sunday. Despite the fact that the case was transferred to the Special Investigation Team (SIT) on April this year for a conclusive investigation, nothing fruitful has come up till date, Tayeng added. The NEHRO has further appealed to the DGP to arrange a polygraph and narco analysis test for one of the prime witness identified in the case and also complete the scrutiny of the call detail records (CDR) of the particular day so as to unearth the truth. This, the organization asserted, would surely assist the process of investigation effectively and ultimately lead to arrest of all the ones involved in the murder. Besides the NEHRO, various other youth organizations and unions have been demanding that the case be handed over to the CBI.